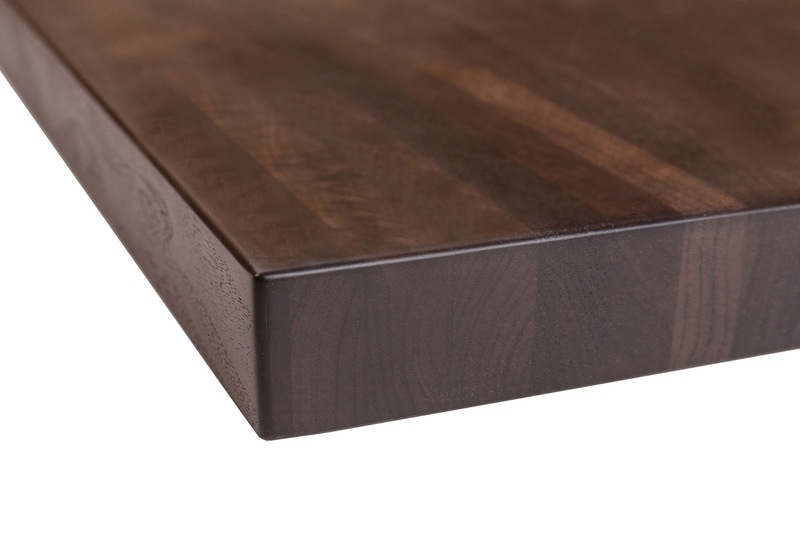 Walnut’s grains are comprised of straight runs, tightly churning swirls, and wandering waves. The variations are universally admired for their ability to capture the eye. Walnut is often chosen in venues that seek to treat patrons to a complete experience where not just every morsel and drink but also every piece of décor and every surface communicates beauty. Butcher Block restaurant tabletops are sanded smooth, sealed and finished with our acrylic polyurethane in a matte sheen. We use multiple coats to promote durability and ease of maintenance. Our tried and proven finish is an industry leader in both wear and heat resistance. 50 square feet is the minimum order quantity. All table tops are made to order with custom sizes available up to 6′ wide and 17′ long. All pricing is for product only. Sales tax (MN purchases only) and shipping are additional. We recommend viewing a product sample before placing your order. Our samples are 12×12 and the first 2 are provided free of charge. Additional samples are $30 each. Purchased samples can be returned within 14 days for a full refund. You are responsible for return shipping costs. For orders under $6,000, payment is due in full when the order is placed. For orders over $6,000, a 50% deposit is due when the order is placed. Balance is due prior to shipment. Effective 3/22/2019: For credit card payments, we impose a surcharge of 2.9% on the transaction amount, which is not greater than our cost of acceptance. 2) Review and confirm all specifications on the price quote. 3) Return a signed copy to us along with deposit or payment. We accept check and credit card (Visa, MasterCard, Discover, American Express). To pay by credit card, we recommend faxing a completed Credit Card Authorization Form or calling to pay by phone. We ship via freight carrier with the products packaged in a crate or box that is secured to a pallet. You will need to have someone available at the time of delivery to unload the crate and inspect the contents. Truck drivers provide delivery service and are not required to provide assistance unloading. Liftgate is an optional service that will place the shipping pallet/crate on the ground. You will be responsible for unpacking and placing the items inside your location. It is available for shipments less than 90″ in length. Because we want to ensure that our tops are stored in a conditioned and temperature controlled environment, we will not ship to a storage location. TimeWorn Wood specializes in transforming reclaimed and new lumber into top-quality wood restaurant tabletops and communal dining tables. TimeWorn restaurant tables are proudly handcrafted in the USA. Copyright © Timeworn. All Rights Reserved.